Doing Lots of things, making progress on lots of fronts.. but nothing is finished! First house cleaning—spring cleaning chores from LAST spring are finally getting done. Now, I have cleaned the terrace --OK that is a real chore that I really didn't pay attention to last year—since my spray painting booth—a couple of pieces of scrap wood and a drop cloth, is set up out side on the terrace. Now, on the next not too windy day—old tins (and some not so old!) will become new ones. I have almost a dozen waiting to be painted! Roy has become ROY G B—I is up next! Looking good too! I am happy with how they are turning out. 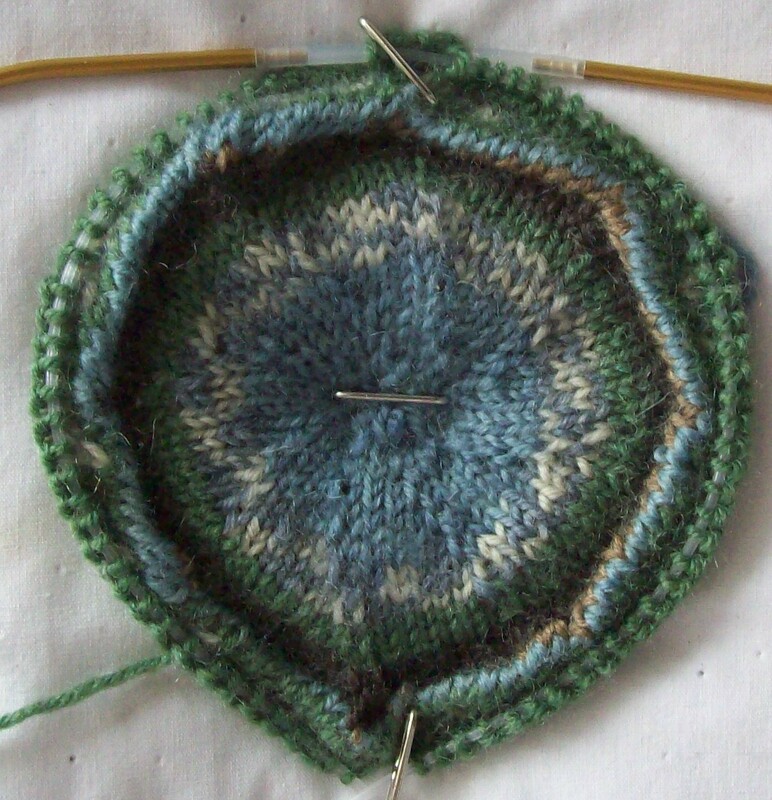 Progress has been slowed—because I am knitting things that aren't socks-Yes, its true! 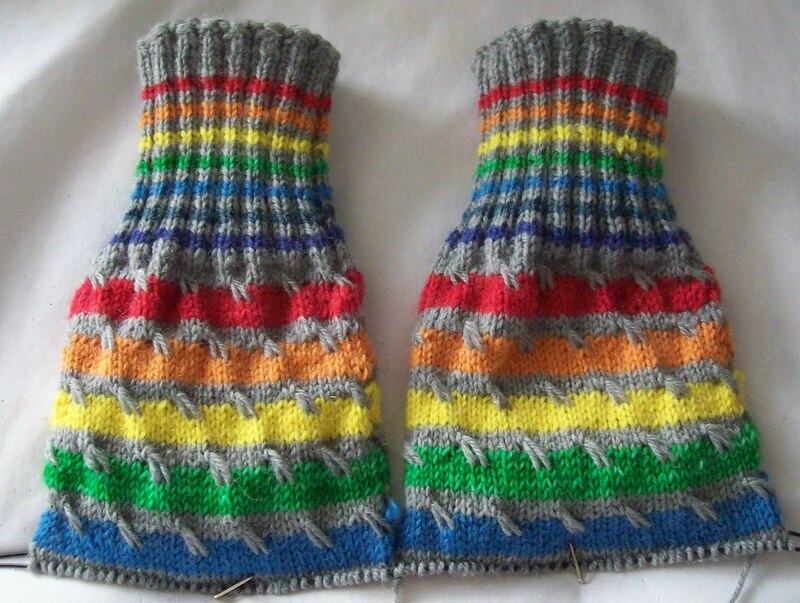 One project is almost a sock—in fact, I mentally call it a bottle sock! Shades of the Winecozy—it's a simple sock for one of my many water bottles. Just as I always bring coffee to work, I bring water (NYC tap water, some of the best water in the world—and FREE) everywhere. I have a few water bottles (and Yes, I have, on occation, used bottle water—but rarely) and I long ago learned to wrap them in aluminum foil, and then tuck them into a sock. It used to be old tube socks, but now, its more often cotton sports footlets. But that will change--I am working on a bottle sock for my wide mouth metal bottle. It's just the base so far.. but now I am at the easy part—not increases—just round after round of self patterning yarn. And that's not all I have been knitting–this last bit is not really progress—because now you see, and later you won't. 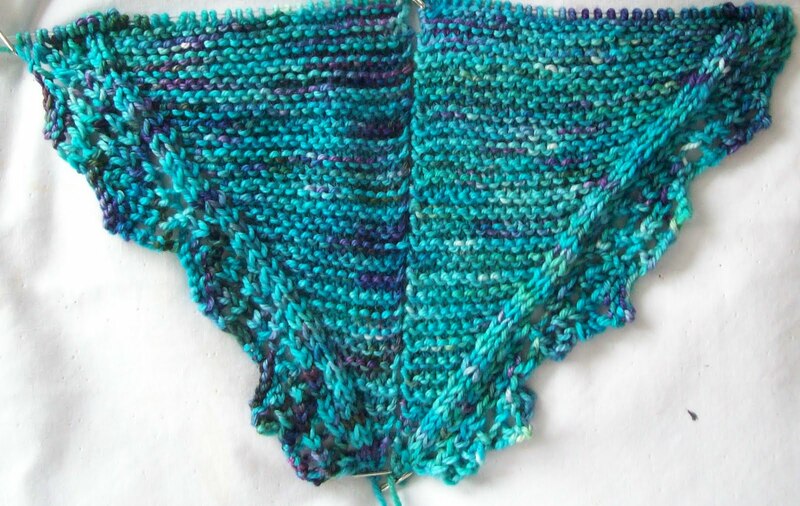 I have been working on it, and the lace edging free hand—and mistake after mistake has crept in, till now. Now its going to the frog pond and will be started again, with a chart and markers,and other tootls to keep my on track! I need a pattern that work bi-directionally, since the plan is to work both halves at once and join when I run out of yarn. Next time, the body of the shawl will be more interesting too. 6 inches in and I was bored of plain garter. And its very clear that one end of the hand painted skein doesn't quite match the other.. a more open pattern will I think, break up the colors more and make it a bit less eveident. The bottle sock is left of Sensations Sock yarn (JoAnne's Fabrics house brand) the Turquoise is Pagewood Farms Alyeska, 80/10/10-Merino/Cashmere/Nylon. It is sold as sock yarn—but much as I love comfort—cashmere is too good for my feet! Cashmere is going round my face! Love how the socks are coming out. So pretty.